Evanston is a wonderful place to ride a bicycle in the company of family and many avid bicyclists living within the city use their bicycles as their primary method of transportation to avoid the high cost of gasoline. Access to the North Shore Channel and Green Bay Trail makes it easy to plan a bike hike with your family and Evanston has made recent efforts to make biking with your family more enjoyable and safe. Unfortunately, accidents may result, especially when motorists are not respectful of bicyclist’s rights on the road and the Evanston bicycle accident attorneys at Rosenfeld Injury Lawyers LLC are dedicated to helping those who have been harmed in these incidents. Evanston has recently recognized the need to encourage safer bicycling habits in hopes of preventing bicycle accidents. This program is also intended to reduce the tension that exists between cyclists and pedestrians by making bicyclists aware of the local ordinances in place to minimize interference with pedestrians and promote safe riding practices. Motorists can also benefit from the pilot program as it details their responsibilities and how they may contribute to making Evanston a safer city for bicyclists. The laws and ordinances that riders must follow are similar to those that must be followed by motorists, but include additional rules created specifically for bicyclists. These rules include walking bicycles on public sidewalks to avoid collisions with pedestrians, the prohibition of bicycle stunts that can cause injury to the cyclist or bystanders and restrictions on the use of headphones, ear buds or other devices that can impair a bicyclist’s ability to hear. In addition to abiding by local laws and ordinances, the City of Evanston recommends that all bicyclists wear helmets, wear clothing that makes them visible at night and check their equipment on a regular basis. Poorly inflated tires and worn brakes are common causes of bicycle accidents, so take a moment to make sure that your tires are inflated to the recommended PSI and that your brakes still work. As Evanston encourages more bicyclists to avoid riding on busy sidewalks, these bicyclists are occupying the streets as prescribed instead. Drivers do not always treat bicyclists as other vehicles, and Illinois state law dictates that each bicycle has the same rights on public roadways that vehicles do and the same laws apply to bicycles as apply to motor vehicles. 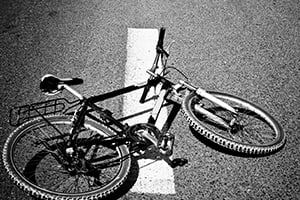 Accidents are often the result of drivers following a bicycle too closely, pulling out in front of a cyclist at an intersection or where he or she is entering the road or turning in front of the bicycle at an intersection. Bicyclists are not well protected in the event that they are involved in accidents, and their injuries tend to be more severe as a result. Some of the injuries common in bicycle accidents include the following. Trauma to the head, neck or spine. Deep lacerations caused by glass, sharp metallic debris and contact with the road. Simple or compound fractures and shattered bones. Following any bicycle accident, it is important to speak with an Evanston bicycle accident attorney quickly in order to ensure the integrity of the evidence that will be used to build your case— if it is determined that you have a claim to compensation for the treatment of your injuries. The attorneys at Rosenfeld Injury Lawyers LLC work in coordination with medical experts, economists and accident reconstruction specialists in order to establish fault in your case and accurately assess the cost of your treatment and out of pocket expenses. We’ve helped hundreds of bicyclists recover the compensation to which they have been entitled under law and will fight to do the same on your behalf. Contact us to schedule a free consultation with an attorney to learn more about your legal options. If we cannot collect on your behalf, our services will be free of charge.